Winter is finally over in Jozi – thank heavens for that! The weather has changed from bitterly cold winter to warm summer in just a few short days. It feels like the good times have finally returned after a longer than usual absence. We have been tossing out a fair bit of fruit during the last week. Everything ripens much faster and that’s one of my few troubles with the warm weather. Avocados, pineapples and mainly bananas are just some of the problem fruits in my home. The bananas became a really big problem when my lovely son, Rushil, rushed out of the car clutching his latest Star Wars stickers instead of the bananas in the boot. Two days later, they were pitch black and squishy. My heart sank and then I yelled, ‘Banana Bread’! The softer the banana, the better the bake! I normally just buy a loaf of banana bread, it’s usually a cheap item, sometimes even under ten rands. It’s a no brainer to pick up a loaf with your shopping, and enjoy it fresh that day, or toasted with a cup of coffee over the next few days. The only trouble with this lazy option is that I find the quality of store bought banana bread varies greatly, and the more expensive ones are often the most disappointing. My blackened bananas gave me the motivation I needed to finally make a few banana inspired bakes of my own. 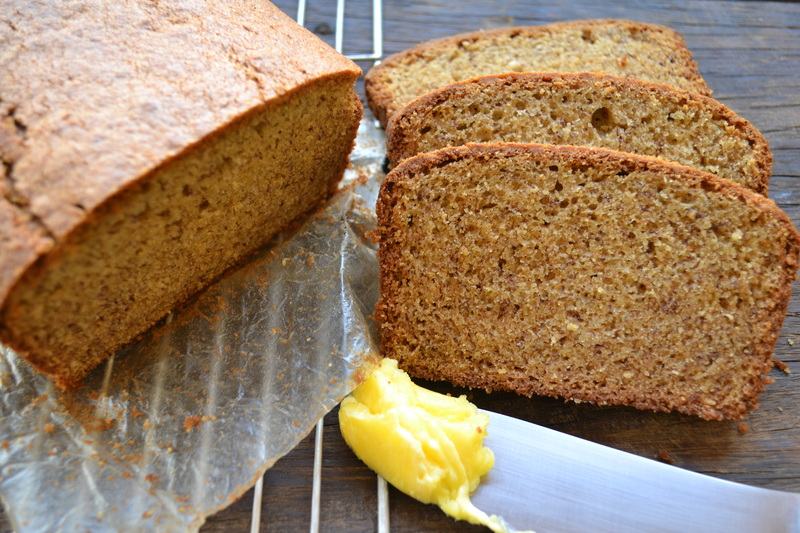 I have always loved banana bread, but about a year ago, Rob went out shopping while we were at the Drakensberg and came back with a heavenly banana CAKE! I decided to give my own version a bash, with caramel sauce and roasted pecans. I prefer the cake when I am looking for something more decadent than the heavier banana bread. The aroma of banana cake or bread baking in the oven is just heavenly. The cinnamon, nutmeg and warm buttery smells waft through the house melting everyone’s resistance including my lovely neighbours. Michelle Theodosiou was kind enough to lend me a loaf tin….mine has gone awol and I paid her back in banana bread and caramel banana cake. She has asked if she can lend me any other cooking implements! Place the eggs in a large mixing bowl and whisk with an electric beater. Gradually add the sugar and continue whisking. When the eggs are light and fluffy, add the mashed banana to the mixture. Sift the dry ingredients into the egg and banana mixture. Pour in the melted butter and beat again until well combined. Spoon the batter into a greased and lined 23cm loaf tin. Bake for 60 minutes in a pre heated oven at 170 degrees celsius. Leave the cake in the tin for a few minutes before turning out onto a wire rack. Serve while warm with butter. This can also be kept for up to two days and served toasted. Makes one 24cm bundt cake. Grease the baking tin with butter and then dust the tin with cake flour. 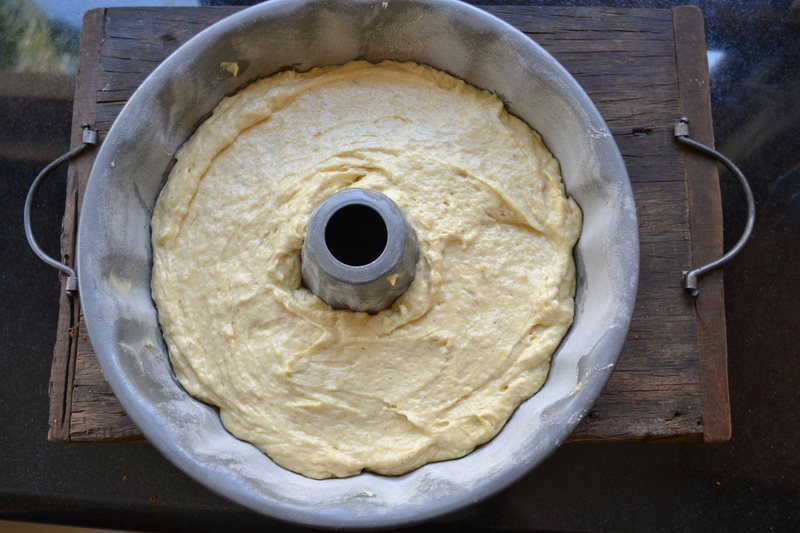 Shake the excess flour off by turning the tin upside down and tapping gently. Place the butter into a mixing bowl and whisk with a hand-held beater. Gradually add the sugar and continue beating until light and fluffy. Beat the eggs in one at a time with a level teaspoon of the measured flour. Sift the dry ingredients into the mixing bowl and stir well to combine. Add the mashed banana and pour in the milk. Spoon the mixture into the bundt tin and smooth the top. Bake for 40 minutes or until a skewer comes out clean when inserted. Leave the cake in the tin to cool slightly before turning it out on a wire rack. Dust the cool cake with icing sugar. Whisk the caramel treat into the cream and simmer gently until the sauce thickens. 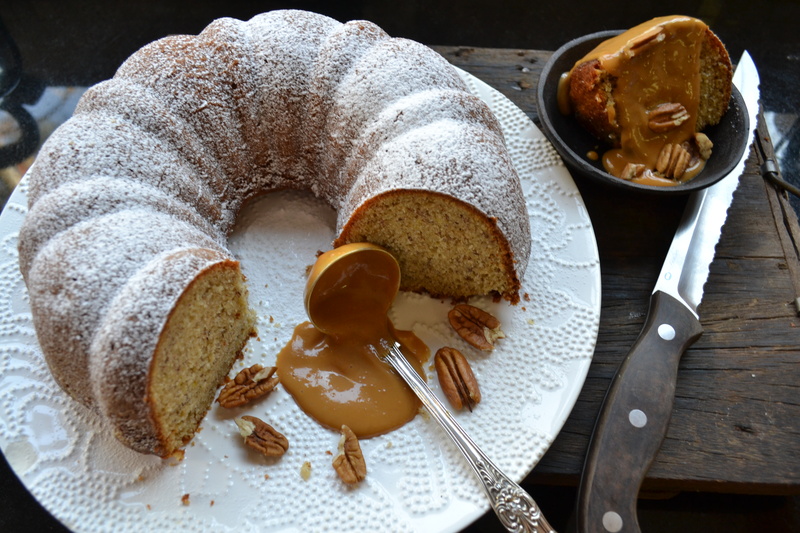 Spoon the warm sauce over the cake and garnish with pecan nuts.